Rediff.com » Getahead » Style poll: Did Rakul Preet rock the tux slit dress? One dress. Two celebrities. Whose style did you like the best? Rakul Preet Singh recently stepped out in a yellow tuxedo dress designed by Alexander Terekhov. The actor certainly did her part to add up to the glam to the dress with a messy pony and minimal accessories. The dress which was a part of the designer's Fall Winter collection was previously worn by American model Jasmine Sanders in June 2018. Jasmine definitely rocked the look with black sunglasses, matching pumps and oodles of oomph! 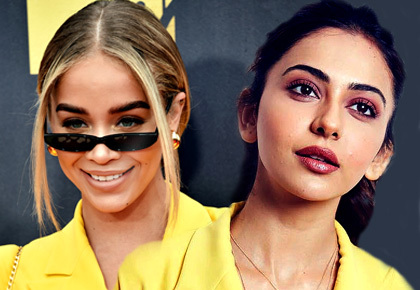 Think Rakul Preet worked her magic better than Jasmine Sanders? Take the poll given below and let us know.